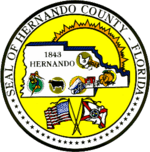 Hernando County is a county located in the U.S. state of Florida. As of the 2010 census, the population was 172,778. Its county seat is Brooksville, and its largest community is Spring Hill. Hernando County is included in the Tampa-St. Petersburg-Clearwater, FL Metropolitan Statistical Area. As of 2005, Hernando was the 35th fastest-growing county in the country. Around 1840, Fort DeSoto was established in present-day Hernando County in the northeast edge of present-day Brooksville to protect settlers in the area from Native Americans. Fort DeSoto became a small community center, trading post, and way station on the route to Tampa. When settlement by the fort began around 1845, it was alternatively known as Pierceville. Then encompassing a significantly larger area of west central Florida than it does today, Hernando County was officially established on February 27, 1843, two years prior to Florida's admission into the Union. It was created from portions of Alachua, Hillsborough and Orange Counties and included all of present-day Citrus and Pasco Counties. 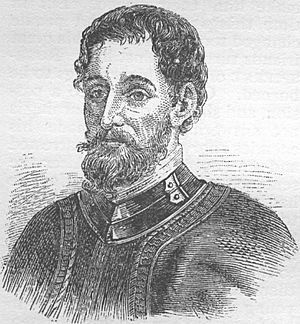 Named for Spanish explorer Hernando de Soto, whose name has also been honored in DeSoto County, Hernando County was briefly renamed Benton County in 1844 for Missouri Senator Thomas Hart Benton, a strong supporter of territorial expansion who aided in the county's creation. However, Benton fell out of favor with the county's residents later in the decade due to his decision to support the Missouri Compromise and the overall reversal of his stance on slavery, and the county's name reverted in 1850. In December 1854, the legislature designated the small port town of Bayport the county seat. Residents living in the eastern section of the county instead desired a more central place for the county government, and by 1855, voters had selected an inland site within five miles (8 km) of the center of the county at the town of Melendez. In 1856, the citizens of Hernando County chose to rename the town, their new County Seat, Brooksville in honor of South Carolina Representative Preston Brooks, who in the same year beat fierce abolitionist Massachusetts Senator Charles Sumner with a cane in the Senate chambers, winning the Congressman great renown in the South. In 1855, town founder Joseph Hale donated land for a county courthouse in the center of present-day Brooksville. Soon thereafter, the structure was completed. During the Civil War, Hernando County primarily contributed foodstuffs, cotton, and lumber to the Confederacy. Although Union ships imposed a blockade on the port of Bayport, runners enjoyed a great deal of success—enough to lead the Union in June 1864 to order some 150–250 troops to destroy Confederate stockpiles in the county. In early July, the expedition marched northward from Anclote River to Brooksville, meeting some resistance from assembled Confederate troops hastily organized to protect the city. The Federal troops won this engagement (known locally as the Brooksville Raid and marched to Bayport, where they and an auxiliary force landing from gunboats sacked Rebel operations. The skirmish between Union raiders and local Confederates is reenacted annually in the county. The county courthousewas destroyed by a fire on September 29, 1877. On June 2, 1887, the Florida State Legislature divided Hernando County into three independent counties: Pasco County to the south, Citrus County to the north, and Hernando County in the middle. Since then, Hernando County's borders have remained unchanged. According to the U.S. Census Bureau, the county has a total area of 589 square miles (1,530 km2), of which 473 square miles (1,230 km2) is land and 116 square miles (300 km2) (19.8%) is water. According to the World Atlas USA, Hernando County is the geographic center of Florida. Elevation in the county ranges from mean sea level along the Gulf coast to its highest natural point of 269 feet at Chinsegut Hill. As of the census of 2000, there were 130,802 people, 55,425 households, and 40,016 families residing in the county. The population density was 106/sq mi (274/km²). There were 62,727 housing units at an average density of 51/sq mi (131/km²). The racial makeup of the county was 92.85% White, 4.07% Black or African American, 0.30% Native American, 0.64% Asian, 0.02% Pacific Islander, 0.98% from other races, and 1.13% from two or more races. 5.04% of the population was Hispanic or Latino of any race. 91.1% spoke English, 4.5% Spanish, 1.1% German and 1.1% Italian as their first language. There were 55,425 households, which 21.80% had children under the age of 18 living with them, 60.40% were married couples living together, 8.70% had a female householder with no husband present, and 27.80% were non-families. 23.30% of all households were made up of individuals and 14.70% had someone living alone who was 65 years of age or older. The average household size was 2.32 and the average family size was 2.70. In the county 18.90% of the population was under the age of 18, 5.40% was between the ages of 18 to 24, 20.40% between 25 to 44, 24.40% between 45 and 64, and 30.90% were 65 years of age or older. The median age was 50 years. For every 100 females there were 90.50 males. For every 100 females, age 18 and over, there were 87.50 males. The median income for a household in the county was $32,572, and the median income for a family was $37,509. Males had a median income of $30,295 versus $21,661 for females. The per capita income for the county was $18,321. About 7.10% of families and 10.30% of the population were below the poverty line, including 15.90% of those under age 18 and 6.20% of those ages 65 or over. Brooksville–Tampa Bay Regional Airport (ICAO: KBKV, FAA LID: BKV) serves southeastern Spring Hill, northern Masaryktown, and Garden Grove. Hernando THE Bus provides bus service in Brooksville and Spring Hill. CSX operates two rail lines within the county. Amtrak formerly provided passenger rail service along the old Atlantic Coast Line Railroad line east of US 301 in Ridge Manor, but had no stops in the county, and the service was terminated in late 2004. The other line is the Brooksville Subdivision, which runs close to US 41, and was previously owned by the Seaboard Air Line. Notable abandoned railroad lines include a former branch of the Atlantic Coast Line Railroad spanning from southeast of Ridge Manor through Istachatta that became part of the Withlacoochee State Trail, and a spur of this line from Croom west into Brooksville, part of which is being replaced by a new rail trail called the Good Neighbor Trail. Though the Good Neighbor Trail only exists within Brooksville itself, the ultimate goal is to extend it to the Withlacoohee State Trail. US 19 (Commercial Way) is a major commercial highway running parallel to the Gulf of Mexico on the western edge of the county, and used as a primary connecting route to cities on the west coast of Florida, including Hudson, New Port Richey, Tarpon Springs, Clearwater, and St. Petersburg, as well as Homosassa and Crystal River to the north. US 41 (Broad Street) runs parallel to US 19 through points in the center of the county, including downtown Brooksville, where it intersects with SR 50 and US 98. It is still a primary connecting route with Tampa. Between Brooksville and Garden Grove, US 41 is a six-lane highway, and between Garden Grove and Masaryktown it is a four-lane highway. To the northeast, US 41 runs through part of the Withlacoochee State Forest. Plans are currently under way to widen US 41 throughout Hernando County. US 98 (Ponce de Leon Boulevard) runs diagonally across the county from the northwest to the southeast, where it exits into Pasco County, and runs concurrent with SR 50 in the eastern part of the county, intersects I-75 in Ridge Manor West and meets the Suncoast Parkway at the parkway's current end near World Woods Golf Course north of Brooksville. US 301 (Treiman Boulevard) is a north-south highway that crosses into the county briefly at its tapered eastern end, running parallel to I-75, and intersecting with SR 50 at Ridge Manor. Interstate 75 runs north and south across the eastern part of the county, with one exit (Exit 301) at its intersection with US 98/SR 50. Once a major connecting point with Tampa, I-75 has been made obsolete for western residents of the county by the Suncoast Parkway. Suncoast Parkway (SR 589) enters the county in the south slightly to the west of US 41, and ends in the far northern part of the county at US 98. (N.B. the Suncoast Parkway is considered incomplete; there are plans for it to extend through northern Hernando County and through adjacent Citrus County and head into Crystal River.) The Suncoast Parkway is a toll road that connects Hernando County with Hillsborough County, where it becomes the Veterans Expressway and heads directly into Tampa International Airport before reaching Interstate 275. SR 589 has four Hernando County exits: County Line Road (Exit 37), Spring Hill Drive (Exit 41), SR 50 (Exit 46), and US 98 (Future Exit 54). SR 50 (Cortez Boulevard) begins at US 19 in Weeki Wachee, runs through Brooksville, and exits into Sumter County at the eastern tip of the county. Along the way, it interchanges with the Suncoast Parkway, intersects with US 41 in Brooksville, runs concurrently with US 98, and intersects with I-75 in Ridge Manor West(Hernando County's only interchange with I-75) and US 301 in Ridge Manor. A significant, well-developed highway in the county, SR 50 originally extended from US 19 to the Gulf Coast at Bayport. This section was given back to the county and is currently CR 550. Currently, S.R. 50 is used as a beeline route from the county to Orlando in the east. SR 50 Alternate (Jefferson Street) is a spur of SR 50 that runs through downtown Brooksville, running concurrently with both US 41 and US 98 at points. Spring Hill Drive (CR 574) is a major county road running roughly parallel to both SR 50 and the border with Pasco County beginning by US 19, intersects the Suncoast Parkway, and ends at US 41. County Line Road (CR 578) is a major county road running entirely along the border with Pasco County beginning at US 19, intersects the Suncoast Parkway, and ends at US 41. Due to increased congestion, it is planned to be upgraded from two to four lanes, and possibly upgraded from a county road to a state road. Hernando County is served by the Hernando County Public Library System. There are 5 branches in the county. Hernando County, Florida Facts for Kids. Kiddle Encyclopedia.